I honestly don’t know what sort of year 2015 has been. I don’t remember most of it. That’s what time is like for me now – just a blur. Things happen and keep happening, and I feel like a dry leaf swirling around and swept onward by the current of life. There were plenty of friends around, mostly old, some new. Plenty of laughs and good cheer. World grew more strident around. D turned all grown up almost overnight. Grew a little wiser and honed my homegrown gems of wisdom. Read a lot. Wrote more than expected.Work was more or less steady. No major hiccups health-wise. What more can one ask for in life? Sometimes I am seized by a peculiar desire – I want to go away somewhere unfamiliar, somewhere difficult – I want to miss my current life. I already know just how valuable it is, and yet I want to miss it so much that I really know its value. That is a very strange thing to desire. Yes, I confuse myself sometimes. A New Year holds little glamour. In a funny way, as you grow older, every day is precious, and so special days aren’t so special any more. Still, there’s no reason not to celebrate, not to feel hope and promise of a better, newer tomorrow. So Happy New Year, folks! May the new year bring you everything you dreamed of, everything you wanted, and everything you really need. Guess Guardian and BBC are also ‘paid’, bikau, news traders and presstitutes! I think Rajdeep needs to read Frederick Forsyth’s autobiography – The Outsider: My Life in Intrigue. In it, Forsyth eviscerates the BBC completely. Its “Africa policy” was so despicable that I have lost respect for BBC. I had such respect for this agency. I remember how we used to see BBC first to get the “right” news, rather than watch Doordarshan with its biased coverage. But gradually, the bias in BBC too was becoming quite visible. Reading the book was a revelation. It makes you lose all trust in the media, which is a real pity. Why has the media become so untrustworthy? The calling of a true news and current affairs organization is to hold the Establishment of any country to account but never to join it. Don’t you just hate it when you think of the most perfect retort much after the moment has passed? I just had this moment when I was reading my own post of a few months ago. Hmmm, maybe I should go and immerse myself in cleaning up the house. But unfortunately, that does not qualify as a Eureka-moment in my books. That’s not a Eureka-moment, it’s more a Eureka-Forbes moment! I laughed to myself, then felt a bit annoyed for not having thought of that when writing the piece. Yesterday, we were all dressed up to go for a pooja. On our way down, a little girl and her father stepped into the elevator. The girl was wearing a really cute little pink skirt that flared so nicely that I couldn’t help complimenting her on it. She was thrilled, of course, and her father got her to pirouette for us too. Dear D and me gushed. And that would have been the end of it. But her father was thoughtful enough to point out something. Look at Dear D, he said. She’s also looking so pretty all dressed up, isn’t she? For the first time, the little girl looked up, away from her little pink skirt. She gazed at D, smiled shyly and agreed with her dad. What a a thoughtful and useful life-lesson! Not to get so caught up in yourself that you fail to notice the beauty around you. To take a moment to admire and compliment other events that are worthy of notice. To keep the ‘me’ aside for some time and look at the world with fresh eyes. Life’s lessons come at the most unexpected of times. Being open to them is enriching. The ubiquitous tea or chai. So many varieties, right from the railway station hot chai in small cups, to the golden liquid that swirls into your cup in a plane. So many tastes, from the strongly brewed and sugary chai to the delicate flavours of green tea. Some of my chai memories include a really tall glass of very strong and rich tea that I drank at a Punjabi household. I still remember trying hard to finish it and hold it in without throwing up. I have green tea every morning which is just plain, no milk or sugar added. In the evenings, I have the usual Indian chai, with the tea leaves boiled along with the water, and a moderate quantity of milk added to it. I like my tea without sugar (I gave up adding sugar a few years ago), but I like to eat a little sweet before my tea. I dislike the taste of sweetness that lingers on after sweet tea; this way, I get a taste of sweet, but it gets washed away by the taste of the tea. Marie biscuits dipped in hot tea are a favourite. For some reason, I just love the tea served on airplanes. I like drinking it plain, without adding the chalky milk powder or sugar. Some of the best teas I have had include my friend’s masala chai, made with homemade masala. Nothing better than to drink one of her chais while gup-shupping with friends! The other one is the chamomile tea I had in Madrid. It was just too good, so comforting and everything about it – the flavour, the aroma, the temperature – just right. It was heavenly! I bought a little teapot in the fond hope that I would brew my own tea, but it didn’t work out so well. I do know some folks who brew their tea in teapots, but I haven’t made a decent cup of tea this way. 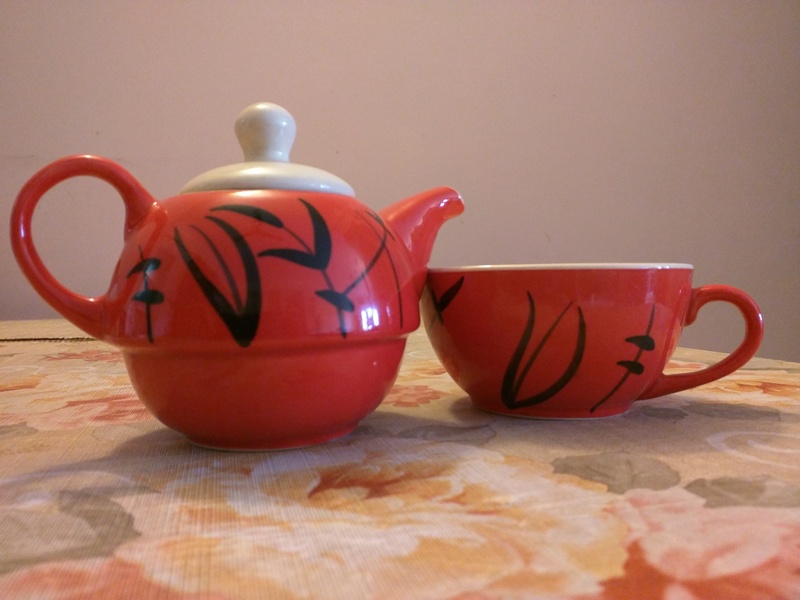 I love that teapot though – it’s red and cheery and cosy. I remember our tea in Darjeeling, when we sat on the terrace (or was it a balcony) overflowing with flowers, looked out into the drifting mist, and sipped hot tea. That was straight out of a book! The weather today is so perfect for curling up in bed with a book and a hot cup of tea. Ah, the small pleasures that life offers. So, how do you like your cup of tea? There are people who think singing and dancing to show your love for your country is stupid and shallow. There are people who think that giving flowers to someone is an empty gesture. There are people who think that spending some time selecting a good gift for someone is a waste of time. There are people who think everyday is special and so celebrations are meaningless. There are people who think saying “I love you” to the people they deeply care about is just lip service. I dismissed all gestures as empty and ostentatious. I hated celebrating my birthday. Now, however, I’m older and wiser. What’s wrong in singing and dancing if that gives you joy and a sense of overwhelming love towards your country? What’s wrong in saying it with flowers? What’s wrong with a well-chosen and thoughtful gift? What’s wrong with joyous and happy celebrations? What’s wrong with expressing and reaffirming oneself whole-heartedly? I say, go ahead and celebrate! Laugh and sing and dance and be merry to your heart’s content (please do not use loudspeakers though :D). Life is boring when you treat everyday just like the next. Let your voice soar, your feet move, and release your spirit. That is what freedom is all about. And don’t let people who scoff at these efforts pull you down. Let them go ahead and be the same everyday. After all, that is also what freedom is all about. Last week, I cracked a problem at work. The issue was a long-pending one, and I kept returning to it on and off, in between other things that were higher on the priority list. It was a niggling problem that didn’t respond to any of the obvious troubleshooting techniques. Last week, I resumed work on it, and there were so many times when I felt the solution was so close at hand, almost at my fingertips, but it remained hell-so-elusive! Finally, I got a breakthrough almost through serendipity. As I tested and re-tested to ensure my conclusions were correct, my level of euphoria rose. When I could successfully claim to have cracked the problem, I felt almost like yelling “Eureka!” The root of the problem was so crazily unrelated, no wonder it remained unresolved through the traditional methods I had adopted earlier. These kinds of moments are getting rarer these days. I find myself unable to be completely absorbed by anything. Books seem repetitive, movies appear cliched, and I just don’t have the energy to indulge in a high level of personal interaction any more with other people. Last couple of weeks, I also choreographed a couple of dances for DD (about time she graduated from Lil D to Dear D, right?) and her friend for some dance contests. Again, this hardly kept me engaged. I’m saying and doing all the expected things, but the level of boredom below is simmering constantly. I really want something I could sink my teeth into, something that keeps me immersed completely, so that when I look at the clock, I go – “Wow!”, instead of “Just 5 mins have passed?” I guess I could set myself up to as many challenges as I want, but that’s the thing. I don’t want to do a challenge just for the sake of challenge; I’ve done that for the past year, trying out many new things just for the sake of pushing myself. I want the immersion to happen organically.